Gosh sometimes I really just need to hear some old school hymns, know what I mean? Not that there is anything wrong with contemporary worship music (I love me some All Sons and Daughters and Hillsong!) but there have been times lately where my soul just needs to go back to the basics and worship with some of the more beautiful words I've personally ever sang along to. There's a band you've probably already heard me mention, Page CXVI. Sheesh friends...these guys rock. They've committed themselves to making hymns more accessible and known again to our younger generations. Amazing right? They've got albums upon albums of all the older hymns you may totally remember, but sung in a more modern, almost folk-like way. I just love it. Like, can't get enough of it. Best part? These hymns that I used to sing in grade school and had forgotten about, are now what I wake up singing most mornings! Pretty much the best way to wake up. Ever. They speak against you with malicious intent; your enemies take your name in vain. Do I not hate those who hate you, O Lord? And do I not loathe those who rise up against you? Praying this hymn and this scripture is a total breath of fresh air for you today. If you'd like is as a computer, iPad, or cell phone background, grab one of those sizes below. Isn't it a blessing to know, that He "knows" us. He knows exactly how he made us. Our temperament, our personality and He uses our unique gifts for His purpose. I love you. Blessed to know you. So thankful for the encouragement you are in my life. The feeling is extremely mutual. I love that hymn! It's so beautiful. 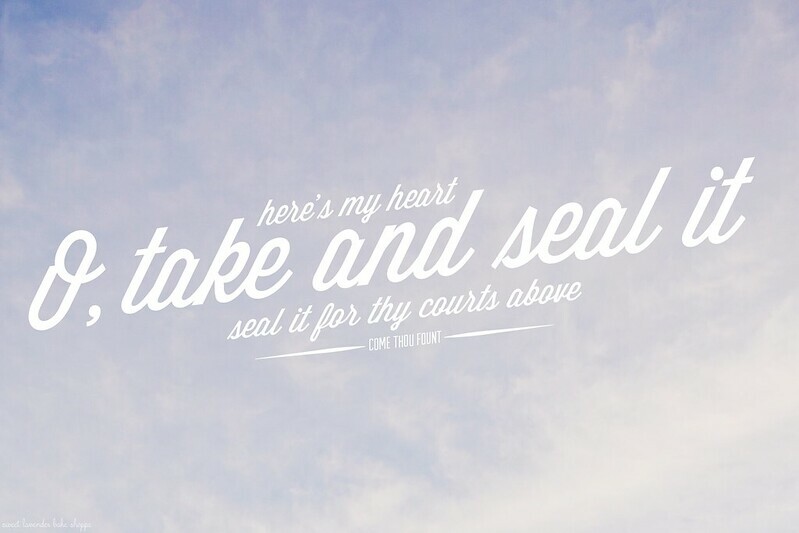 Come Thou Fount is my absolute favorite hymn! I've got to check out Page CXVI -never heard of them! Come Thou Fount is my favorite hymn. I had it played at our wedding when we took Communion together. I so very much agree Meg! This is one of my favorite hymns too! I remember hearing it a Loy in college and I loved singing the chores over and over again.